Last week we reported about the latest Symbian^2 devices that were launched and already available now on Japan. One of them is the Fujitsu docomo Prime series F-06B and I’m pretty sure that name is long enough to forget but its specifications and features don’t agree with me. As it will be the first (correct me if I’m wrong) mobile phone to have a 13.2MP camera, full HD or 1080p video recording with wide angle flash working inside aquarium support and many more drooling camera features. It’s also a water resistant folding phone with a rotating 3.5″ touch screen. 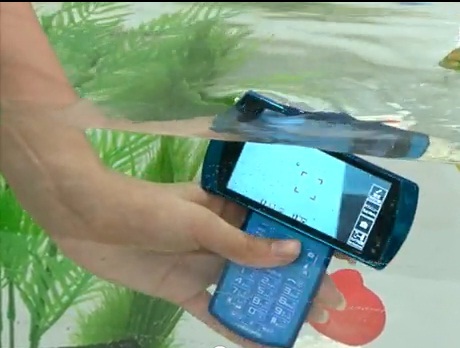 Below is a video from TokaiWalkerCH showing a F-06B inside aquarium taking a picture of a fish. Very clever, eh? What the Hack is Symbian^2? Nver heard of that! Just sceptical by Symbian^2, I wish it is not as closed as MOAP(S) v6 (based on Symbian). Does it also have a mp3 player and wi fi. Is this a Gsm phone?? It’s a smartphone. It’s a touch screen and it can do all things that a smartphone have.